I'm really not sure what to say about We Were Liars, and I don't think I've ever been this conflicted about a book before. 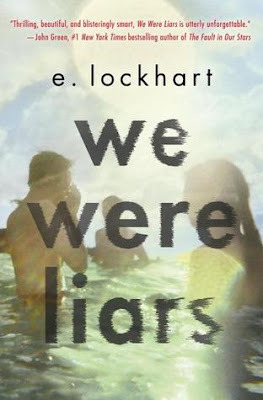 I'm going to briefly share four things I think you need to know about We Were Liars, followed three reasons (one of them very vague) why this book just didn't work for me. 1. The less you know the better. I absolutely agree with all the reviews that say the less you know about this story the better. The climactic moment of We Were Liars hinges on a major plot twist that you don't want to know beforehand. The book is narrated by Cady - the "brilliant, damaged girl" described in the summary - who has no memory of the "accident." If you're like me, you'll spend a lot of the time leading up to the twist trying to guess what exactly happened. But it's better if you don't have any real idea what's coming. 2. The hype machine is in full gear for this book. To be honest, I can't remember the last time there was this much hype surrounding a book. I feel like so many of the early reviews for this book have been fawning proclamations of love. There's nothing wrong with that at all - it's awesome when people are really passionate about a book. I'm just not in that camp with this one. I spent most of the book confused but still enjoying what I was reading. Until I wasn't. And then I never recovered my former positive feelings. 3. The writing style is lyrical, but it's also very confusing and disjointed. One thing I really liked, particularly in the beginning, is the writing style. It's confusing and hard to connect to, but it's also really different and memorable. You can tell that Cady isn't totally mentally sound from the way it's narrated, so I think it was a fitting decision to write the book this way. But it's also really frustrating at times. The disjointedness started to grate on my nerves by the end, but I can still admit that I think I get the reasoning behind it. 4. The story will leave you talking. Whether or not you like this book, you'll probably want to talk about it. This is nothing like the other books I've previously read by Lockhart, except that I think most of her books provoke some kind of discussion. I can absolutely say that I wanted to talk about this book by the time I closed the last page. I had so many thoughts, and it was the first time I wasn't able to rate a book on Goodreads immediately after finishing. I had to take time to sort through my feelings, which were incredibly intense and conflicted. 1. The characters and their relationships. I'm not sure if it's because of the way it was written or the brevity of the book, but I really struggled with these characters and their relationships. They are almost all unlikeable (not a deal breaker for me), but what bothered me more was that I found certain elements of their interactions and conversations to be almost unbelievable. It required too much of a suspension of my disbelief for me to really buy into the story. The twist left me completely emotionless because I didn't care about these people who were mostly awful, very entitled and made such stupid decisions. 2. The twist was one of my biggest bookish pet peeves / deal breakers. I can't say what the twist was because that would spoil it, and I promise not to do that. However, I do have to acknowledge that I actively avoid books that use this element for a story's resolution or as an explanation for the majority of the plot. I find it incredibly frustrating when a book I've become invested uses this particular element, so my reaction to this book was definitely affected by my personal dislike of books with this kind of twist. 3. The way I felt when it ended. A lot of early reviews have indicated that you should have tissues nearby when reading because the book left them in tears. I felt absolutely none of that when I turned the last page. My overall emotion was anger and complete frustration. There was nothing hopeful for me about the way We Were Liars ends. It's an ending that doesn't really provide much closure, and it sort of highlighted all the issues I was having with the book by that point. I can't stand how conflicted I still feel about this book. Why Can't I Rate It? I developed a new rating system not that long ago, but I can't use it for this book. There's really no fair way to assign one of my rating phrases to We Were Liars. I think many readers will love it - there is a reason it's being hyped this much - but I wasn't one of them. I don't want to discourage anyone from reading it because I know some of my feelings were based on my personal dislike for one of the elements that is crucial to the conclusion of this story. No book works for everyone, and this one definitely didn't for me. "It was love, and it hit me so hard I leaned against the screen door that still stood between us, just to stay vertical. I wanted to touch him like he was a bunny, a kitten, something so special and soft your fingertips can't leave it alone. The universe was good because he was in it. I loved the hole in his jeans and the dirt on his bare feet and the scab on his elbow and the scar that laced through one eyebrow." *I received a copy of this book from Delacorte in exchange for an honest review. I was not compensated in any way. Though I LOVED this book because I LOVE E. Lockhart, I have appreciated the critics of the story. There are some definite issues that I've considered more as I've let the story digest. In particular, the with the twist. I was expecting something a little more unique and didn't get that. That hadn't fully hit me when I wrote my review, and I don't know that it would change my overall rating of the book. But it had definitely been noted. Great review! I have loved everything else I've read by Lockhart (Ruby Oliver + Frankie Landau-Banks). I really wish this one had worked better for me! It was weird because I was somewhat enjoying this while I was reading it but then just became increasingly frustrated with it. Maybe it was hyped too much for me? I totally can see why some people have loved it. The writing, setting, characters, etc. felt unique and different and that's a great thing! you already know my feelings about this book hahaha but I'm going to re-read it to try to give it another shot. I really think the hype did a disservice to the book because I was expecting SO MUCH MORE! I probably would have liked it more if my expectations weren't so sky high, especially with the twist. once you know there's a twist, it's pretty easy to guess. Haha! Oh yeah, I'm so glad we were able to talk about this one together. Keep me posted after you re-read, pretty please. I totally agree on the hype doing this book a disservice. I think it totally sets expectations way too high because I probably wouldn't have been as rage-y after finishing if I wasn't anticipating it being so much more. I will agree that I think the hype put my expectations way high on this, but I still REALLY enjoyed it! I didn't feel the emotional connection between the characters that I wanted to but I think the writing was amazing and beautiful and it filled in the holes of the emotional connections I was missing. Sad you didn't enjoy it more! there is so much about your review that i agree with and i mention a lot of it in my review (which will go up at the end of may). i felt pretty much the same way you did (and I know we talked about it), but i really didn't like the twist either and it left me feeling used in way. it was cheap & manipulative. also, i don't believe the way they treated Cady after we find out the truth, i believe there would have been much more anger directed at her and probably her mother. ah, i can't really say much, as you know, but you know what i mean. Oh good! I really hate when I have such a strong dislike for a book that's getting a lot of buzz. TOTALLY agree on cheap and manipulative! I think that's why the whole thing made me so angry afterward. And I also second what you say about the way they treated Cady! That didn't ring true for me either. Totally know what you mean! This is another one I've stayed absolutely away from because of the hype machine. Yours is the only thing I've read, but I agree that I've mostly seen mad mad praises for this one, although I don't really know why because I haven't read the summary. I love the way you listed out the things about this book. (: Thanks, gal. I'll be curious how you feel about this one! It seems like this book has inspired some very conflicting thoughts. I'm always cautious when there is a ton of hype - I don't think the hype worked in this book's favor for me. Keep me posted! I really liked the way We Were Liars was written! It was definitely jarring and unexpected, but it also added to the mysterious quality the book already had. However, I found it really hard to connect with any of the characters, which really affected how much I wound up liking the book overall. I think I appreciated the writing style more at first and then got a little frustrated by it all. I completely agree on not really being able to connect to the characters! This book is so confusing, isn't it? I didn't really like it, I don't think, but I am still impressed with it. I did like the twist, even though I agree that it was a bit too convenient. The writing style was beautiful, but I hated how underdeveloped the characters were (and also just plain detestable). I think the author didn't develop this book enough for the sake of the twist, but that's no excuse. Gah.